Well, it's like Vampiric Tutor in that it puts it on top of your deck, but it's a sorcery that fetches sorceries. Still, this card can definitely see some use. It only has a one mana cost, and it's blue, meaning this card is virtually guaranteed to read "Put Wrath of God on top of your deck" for U/W control decks. It also has some use in combo decks that use sorceries for pieces of their combo deck. A definite winner. Here is a card that's similar to another card. The other card is Vampiric Tutor. Vampiric Tutor lets you get anything, but at the same time costs you two life. This one simply cost you a blue mana. The drawback though is that you are relegated to taking sorceries. That seems OK though in the grand scheme of things. 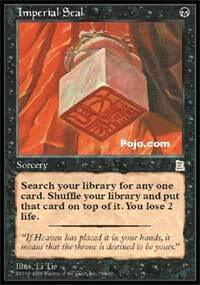 And when we are talking about Vintage (Type 1) play, there are a lot of sorceries that are worth fishing out. I absolutely love any card that actually says Tutor in the title, since it makes the job of spotting it as a good card easier. Although Personal Tutor is by no means a Demonic Tutor, a Vampiric Tutor, or even an Enlightened Tutor, I do think it is a decent enough card to see play. I won't rate this card incredibly high, but I'll put it up around a three. Limited play makes this card slightly less powerful than it is in Constructed or Casual, since you'll rarely have more than a few sorceries that make the cut. Unless I have one bomb sorcery and a couple other decent sorceries, I'll probably leave Personal Tutor in the sideboard. Tutoring for a sorcery, at sorcery speed. Hot hot hot, and the price on this puppy has soared in the past week. Kinda boring for casual, but you might consider it for limited if you have a couple awesome sorceries you'd like to see.